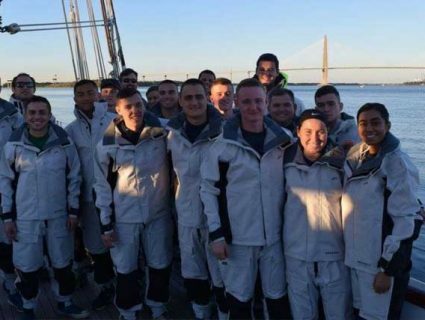 A group of 15 Citadel cadets are preparing to sail out of Charleston harbor to experience a semester at sea. The program, “Citadel at Sea,” allows the cadets to learn the ropes of sailing from qualified crew members of the tall ship The Spirit of South Carolina…. When in port, you can find Spirit of South Carolina docked at the Charleston Maritime Center. You can’t miss her topmasts rising above all other boats bobbing in the marina. You’re welcome to come aboard for an unofficial tour, when invited by a crewmember. Just ask!